Ever wonder how to get healthy hair? LoveToKnow searched for the answers and found the expert advice of Linda Leigh, also known as the Hair Doctor. Linda Leigh, owner of Hair in Vogue, is a hair artist based in Brentwood, California who specializes in creative hair replacement. She received her formal training at Vidal Sassoon Academy in cut & color, and proceeded to learn the art of hair replacement and the making of custom hair pieces and extensions. 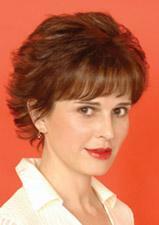 Linda received her doctorate in clinical psychology in 1993 where she specialized with the creative process. As an educator, Dr. Linda Leigh has presented workshops to the Los Angeles Times, UCLA Extension, and The American Film Institute. Although how to get healthy hair is a lifelong commitment to proper diet, conditioning, cleansing and care, there are many situations, whether medical or emotional, that can affect the condition of hair growth. From her personal journey with hair loss as a result of the autoimmune disorder alopecia areata, Linda Leigh shares her tips on how to get healthy hair, and a healthy frame of mind. Sit back, relax and read on, the Doctor is officially in! LTK: Not only do you have your PhD in Clinical Psychology, you've also experienced hair loss after battling alopecia areata. From a psychological standpoint, how does hair loss influence one's self esteem? LL: Hair loss dramatically lowers one's self esteem and self confidence. Psychologically it affects several core issues. It affects the "ego boundary" which can leave the person feeling vulnerable & unsafe, damaged & undesirable, unattractive & unlovable. In addition, there is a deep shame associated with hair loss. LTK: You offer a very high quality line of hair extensions and hair pieces to help add fullness and volume to thinning, sparse hair and for coverage when dealing with hair loss. What was the inspiration behind this line? LL: My own journey of having lost my hair after receiving fertility treatments and struggling with alopecia inspired me to help others. One does need to invest in a high quality customized piece in order to feel like the hair is really ones' own and to feel whole again. LTK: What environmental or chemical factors effect the overall health of the hair? LL: Hair reflects both our inner and outer worlds. What we take in such as our diet, vitamins, supplements-- all affect the health of the hair. Eating a diet rich in protein makes for healthy, shiny hair. Biotin and silica are very good supplements for the hair. The chemicals we put on hair such as color, products, gels, sprays, mousse, straightening solutions -- all affect the integrity of the hair. Hair color containing ammonia, hair products containing alcohol, straightening systems all damage and weaken the cuticle of the hair. LTK: Are there any significant differences in the healthy hair needs of Caucasian or African American hair? LL: Yes, African American hair is more coarse and tends to be more dry. It needs to be washed less often and requires a lot of conditioner. I often will leave conditioner in the hair without washing it out, which brings out the natural curl of the hair as well. With curly African American hair, the conditioner can act as a styling product wrapping and twisting the conditioner along the curl of the hair. LTK: What hair products can maintain the integrity and overall natural health of the hair? LL: Healthy hair contains moisture, therefore hair products which replenish and seal in moisture are very good for the hair. For example, glycine nourishes the inside of the hair; proteins repair the cuticle layer. Oils such as wheatgerm and keratin provide the hair with a protective coating. Hair products such as the Wella SP line, Phyto, and Renee Futier all have ingredients which promote healthy hair. LTK: When clients receive color and straightening services, including extensions, it's expected that some damage will occur. What tips can your provide to keep hair its healthiest while being chemically or color treated? LL: It is very helpful to immediately replace the moisture which is lost with chemical services. I offer a protein mask or conditioning gloss after coloring the hair which locks in the color so it lasts longer and also replenishes the moisture necessary for healthy hair. Color protect shampoos & conditioners which contain vitamin B5 are very helpful. With respect to extensions, one needs to take care of their extensions with the directions we provide. LTK: In your experience, after chemotherapy or hair loss, does hair grow back in a healthier state than before? LL: No, not usually. After chemo the hair is often thinner; and the same applies to medications which affect hair loss. I have often seen the hair grow back in a different texture, for example a person with straight hair grows wavy or curly hair. LTK: When coping with medical treatments (such as chemotherapy) or medical conditions that cause hair loss, such as alopecia areata, what can a person do to look and feel their best? LL: It is very important to invest in a good hairpiece whether it is a wig, a top piece, hair extensions, which bring out a person's beauty and assist to restore their sense of self and wholeness. Hair color, texture, and of course the cut are all essential to a person looking their best. Having friends and people around who see and validate one's inner self are valuable. Engaging in a creative activity, such as one's work, art,, hobby, which builds self esteem from the inside is important. LTK: We all need a positive boost every now and again. Some of our very special readers may be experiencing or awaiting hair loss from treatments or medical conditions. Any positive or encouraging words you could share? LL: We live in an age where there is so much one can do for thinning hair. Wigs and hairpieces have come a long way from what they used to be in terms of looking natural and feeling comfortable. And they are fun when used to change or enhance one's looks when you feel like it. One also gains a lot of internal strength going through the process. Although it is a difficult journey, there are many gifts mastering it. I wouldn't trade the wisdom I have gained and the person I have become for anything. I no longer want to be the person I was when I had full, beautiful hair. I enjoy having more depth & compassion, giving to the world, and doing work which is meaningful. LTK: Thank you for sharing your compassion, experience and expertise with our readers! LL: Thank you for the interview. I hope it is helpful.